Members of the State House of Representatives hold 2 year terms of office. All districts are on the ballot in 2018. 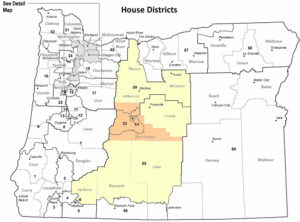 The map at right shows Deschutes County in orange and the districts which include our county are in yellow. Click to enlarge. Knute Buehler is giving up HD 54 in Bend to run for governor. Mike McLane in HD 55 was anticipating a sweetheart federal appointment from the Trump administration... but got passed over. He remains the House Minority Leader. John Huffman in HD 59 abruptly resigned expecting to get a sweetheart federal appointment in the Trump administration... and he actually got it! Daniel Bonham from The Dalles has been appointed to fill the remainder of his term. 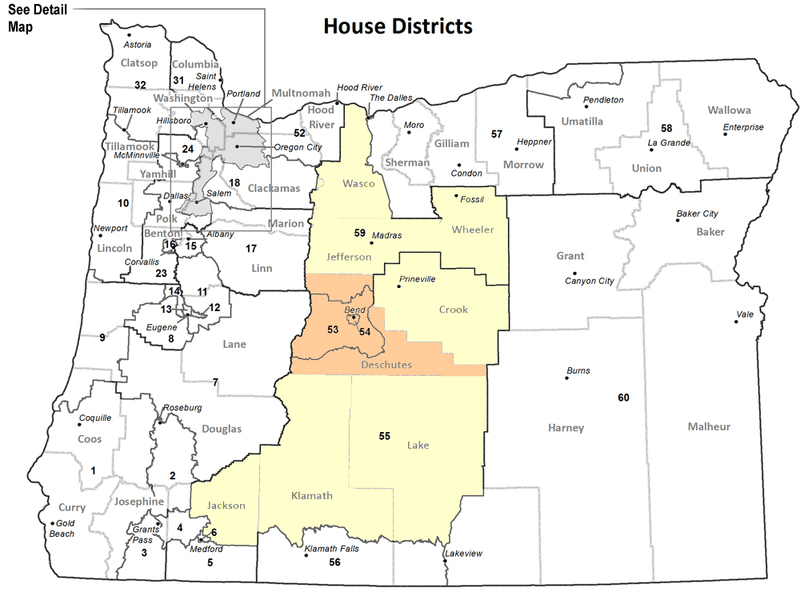 This district neatly covers most of Bend. Demographically, it is roughly composed of one third each Democratic, Republican, and non-affiliated voters by voter registration, although it is leaning more heavily Democratic in recent years. The donut that surrounds Bend. 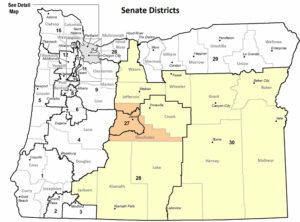 This district covers Redmond, Sunriver, Tumalo, and most of the unincorporated area around Bend. Voter registrations lean a little more red than HD54. Members of the State Senate hold office for 4 years. Only half will be on the ballot in 2018. 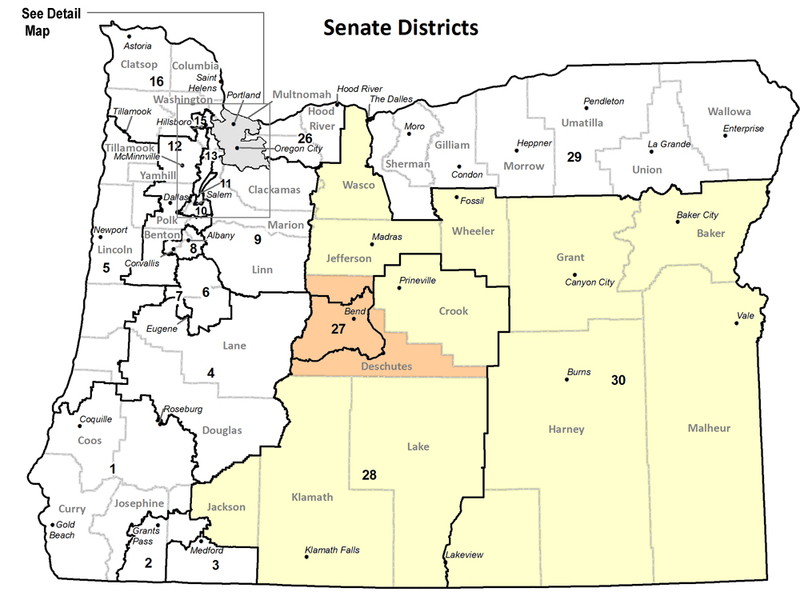 For Deschutes County, that means only SD30 will be on the ballot this year. Look forward to change in 2020! 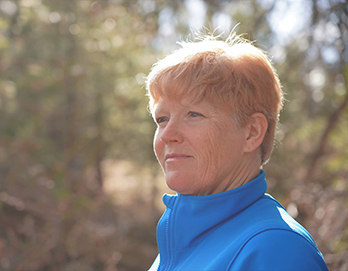 This sprawling district winds from The Dalles to the Nevada border and includes Sisters and North Deschutes County. The incumbent, Ted Ferrioli, resigned after being appointed to a regional power commission. Cliff Bentz (R-Ontario) was selected for the position by a vote of county commissioners and courts representing the counties covered by SD30. The candidate elected in 2018 will serve the remaining two years of the four year term that Senator Ferrioli resigned from.